The message on the home page of Love the Dogs, London Wimbledon Stadium’s website, reads, “sadly Wimbledon will be finally closing its doors on Saturday 25th March after 89 years of greyhound racing here at Plough Lane.” After the closure in 2008 of the doors of Walthamstow Stadium’s iconic art deco façade, the Wimbledon site, making way for AFC Wimbledon’s new football stadium, is London’s last dog racing venue. It seems tragic for a sport which once welcomed a staggering 25 million people through the turnstiles of its 52 licensed tracks, and employed 30,000 people during its heyday in the 1930s. It was a Canadian cement magnate, Brigadier-General Alfred Cecil Critchley, who first introduced greyhound racing as we know it to Britain from America after forming a partnership with Charles Munn, an American who saw the potential of track-based greyhound racing with the use of an electric hare. Critchley formed the National Greyhound Racing Association to regulate the sport and worked hard to give it an acceptable, almost glamorous veneer. It was soon attracting “society” to the turnstiles, or more often, to the elegant dining rooms and bar lounges attached to the huge, modern stadium complexes. Wembley’s Empire stadium for instance had a dancing and dining room of an area 15,000 square feet where one thousand diners could be accommodated at a time, while out of its ten bars, one, according to the claim of the stadium authorities, was the longest in the world. To 21st century race-goers who associate a night at the dogs with a rather earthy cocktail of working class bonhomie, flat caps and basket meals, it may seem strange to envisage ladies arriving at White City in their bias cut satin evening gowns. But, in fact, greyhound racing of the 1930s attracted all levels of society from the working classes filling the stands to the well-heeled diners watching in the rarefied environs of the stadiums’ silver service restaurants. And smart, society ladies tended to have more than a superficial interest in the sport; many were breeders, owners and trainers. One lady breeder, Mrs C. Clarke who wrote a history of the sport in 1934, noted that, “women have been the keenest supporters of track racing from its commencement: they form a large proportion of the huge crowds seen at various tracks”. Advertisements for race tracks bear out this claim, with illustrations featuring the smart set in evening dress cheering on the winner. Mick the Miller, the most celebrated greyhound champion was owned by Mrs Arundel Kempton, whose husband had bought her the dog as a gift for an enormous sum – 2,000 guineas in 1929 (the equivalent of £91,500 today). The investment proved a canny one as the dog continued his winning streak before pursuing a lucrative film career. Patrons of the greyhound track included Tallulah Bankhead, Gracie Fields, Jack Buchanan and even King Alfonso XIII of Spain who enjoyed the 1930 Greyhound Derby at White City. As the sport gained in popularity, so the greyhound came to be a representative icon of the art deco period, its sleek, streamlined appearance the embodiment of 1930s style. Greyhounds were the subjects of paintings and bronzes, and the wittiest cartoonists of the day drew inspiration from dog racing. And with their graceful, good looks and winning ways, greyhounds proved excellent advertising subjects, particularly for whisky brands such as Johnny Walker and Black & White. So where did it all go wrong, or, to coin a phrase, go to the dogs? 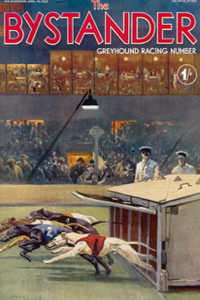 Despite its huge success, greyhound racing did have its detractors in the thirties, notably from the anti-gambling lobby who argued that the phenomenal rise in dog racing had contributed exponentially to an increase in betting and the resulting social problems. Residential groups also opposed new proposed stadiums at Crystal Palace and the Oval but the existing stadiums, numbering over forty by the late 1930s continued to do a roaring trade. Although greyhound racing had begun to fall out of favour with the middle classes by the beginning of the Second World War, it remained the third most popular leisure activity in Britain (behind cinema and football). Even in the late 20th century, greyhound racing enjoyed something of a renaissance: Walthamstow famously welcomed Vinnie Jones and Brad Pitt through its turnstiles for a good, old-fashioned night at the dogs. Some might have argued that there was still hope for the future of greyhound racing but Wimbledon has now gone the way of Catford and the twenty other greyhound stadiums that have closed over the past decade. Unlike the society ladies who once frequented the greyhound stadiums of yesteryear, this particular lady will be all dressed up with nowhere to go.